Just more nonsense from the MSM. Brian Ross from ABC World News did a story yesterday about how big corporations and wealthy donors party it up at the convention trying to influence the candidates. Time will tell if they will report on the big contributors at the DNC. Sadly, not even surprising anymore. Just more verification of the tremendous disadvantage faced by Mitt Romney – or any Republican Presidential Candidate – when the media all over America are such shills for the Democrats. This comment happened to get caught on an ABC News open mic, with the voice reportedly being the “Yahoo! News Washington Bureau Chief.” But you wonder just how much of this goes on that we never hear. My guess is, a great deal. NewsBusters has all the details. Mediaite is also reporting the story, pointing out that Barack Obama goes right on fundraising and campaigning during the Hurricane. But, of course, no media criticism for that. Today I lost a hero. I was five years old and my family was camping on the Colorado River in Marble Falls, Texas, on property that my grandfather owned. It was a summer tradition that was continued into my adulthood. I can hardly remember that moment, since I was so small, but I remember my parents talking about that particular lake trip for years. The trip where we sat gathered around the black and white portable TV that my grandfather had brought along just for the occasion and watched along with the rest of the world, what could arguably be called, the most defining moment in modern human history. While I only have vague memories of that day, I do remember watching subsequent lift offs, and splashdowns, on our trusty Zenith console TV, or at school. This is how my love affair with the space program was born. I begged posters and lunar module models from my brother. One of my most memorable family vacations, was a trip to the Johnson Space Center, were we got to see the places where the Lunar Astronauts trained, got to see a recovered capsule and got to walk the sacred ground of the real Mission Control. I wrote a report for school on the Space Shuttlebefore other students even knew there was a shuttle program. A few years later, when I came to Florida to meet my future husband’s family, I got to go to Space Kennedy, and though I only got to see them through the windows of a tour bus, the launch pads where so much history was made, were an awe-inspiring sight. Even now, I’ll still get up in the middle of the night to watch a launch from my front yard, even thought the Cape is nearly a hundred miles away. Those match sticks rising up into the air, a testament to what man can accomplish when the spirit of adventure takes over. In this day of flashy rock stars, arrogant athletes, and outrageous behavior, I wonder. Will there be huge mobs outside the gates of Space Kennedy holding a candlelight vigil? Will there be imposing mounds of flowers outside his home? Will the streets be filled with teary-eye, adoring masses as his funeral procession passes by? Probably not, and the humble, unassuming Neil Armstrong would want it that way. True heroes are remembered in quiet reflection. Each of us contemplating how this man’s accomplishments touched our lives. 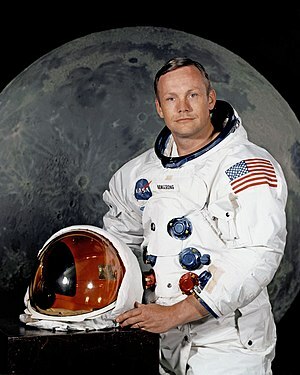 I never met Neil Armstrong, yet I feel a deep personal loss. One of the few men who can truly say that they have touched heaven, has gone there to stay. As a footnote, how appropriate it was for NASA to honor such a rare human being on the date of a blue moon. I sat at my desk today, doing what I do every Thursday. Juggling bills. As I pondered how much I would have left for groceries, after paying the phone bill, and gassing up the old “Silver Toilet”( my very thirsty pickup truck), a thought occurred to me. How is it that so many people have no real understanding of our national debt? We hear about it all the time, ” our grandchildren will be faced with the burden of our national debt”. But do we ever really think about what that means to us as individuals? Household economics is really pretty straightforward. If there is no money left after paying the bills, then you don’t eat. Skip out on your power bill, you sit in the dark, decide you’d rather go on vacation than pay your mortgage, bye-bye home. Real life teaches us that if you continue to spend more than you make, eventually it will all come crashing down around you. It works the same way with the government. It doesn’t matter what kind of fancy economic theory you adhere to, the simple fact is that our country is broke. I know, you’ve heard that before, so what? Well, what that means to me is that I’ll have to depend on myself more, and government less. It means that the Pell grant my daughter depended on for college isn’t going to be there, my Tricare premiums are increasing, and Social Security isn’t even a factor in my retirement planning. It doesn’t matter what the politicians promise, we have two choices, realize that we are going to have to accept cuts to government programs now, or wait until the government defaults and then completely lose that safety net while the economy implodes on itself sucking us in with it. Either way we will have to become less dependent on to government. Given that cuts are inevitable, what makes more sense, to have a president that aims to control more of the population by increasing their dependency on government programs? Or a president who can make the tough cuts necessary to balance the budget? We have to ask ourselves, do we want to suffer the controlled hardships of a government learning to live within its means? The way the rest of us do. Or do we want to live through the devastation of a complete economic meltdown? Americans have a noble tradition of pulling on our boots, rolling up our sleeves, and shouldering the work. We don’t run from hardship, we face it head on, grit our teeth and gut it out. It will be interesting to see, if this new voting generation will rise to the challenge, or if they will just curl up in the fetal position, consoling themselves with You Tube and reality TV, while waiting for a savior to come and bail them out. The other day I was watching TV with my daughter when a commercial from one of Mitt Romney‘s Super Pacs came on. She sat shaking her head then stated. “I don’t like Mitt Romney”. This started a discussion on the comparison of the negativity of political campaigns. Her rather discouraging reply was, “don’t get me wrong, I don’t like Obama either. I don’t think either candidate is any good. I makes me not even want to bother voting.” This is her first time getting to vote in a Presidential election and she’s already so disgusted by the campaign crap that she’s just done with it all. I felt so disappointed for her, and so afraid for our future. I can still remember the pride I felt the first time I got to vote. Even after four years of Ronald Reagan, we could still feel the hopelessness of the demoralizing presidency of Jimmy Carter. Proud once again to call ourselves Americans, we young rural Texans were going to make sure we didn’t go there again. I was excited about going to that tin shed out behind the Old Rock Church, to mark my poster sized ballot and put it into the lock-box. I felt as though I were really making a difference. Not in any election since, have I felt that way. No longer do we have the pleasure of electing a hero who will bravely lead our country to a place of honor and respect in the world. Now we have to settle for trying to discern who will do the least amount of damage. Gone are the grand designs for peace and prosperity, boldly put forth by men like President Reagan. We are left with mud-slinging salesmen and morally bankrupt hypocrites. We no longer go to the polls to elect a leader, we go instead to choose between the lesser of two evils. No wonder, that our young adults are so disillusioned. Right now the America that has become the most prosperous nation on earth, the country the rest of the world looked up to as an example of leadership, and decency is in grave danger of perishing. Sitting in the Oval Office is a man whose personal philosophy is the polar opposite of that of our Founding Fathers. Someone who has no real understanding of an American culture, and no respect for the “separation of powers” established by our Constitution. Through deceit and subterfuge he bypasses the “checks and balances” of our system of government in order to push through his own agenda. A vision of America where those who live by their own hard work and ingenuity have to share the fruits of their labors with those who choose to do nothing. Where charity and compassion are no longer the way that men of integrity separate themselves from the lazy and selfish, but are government mandates instead. Where peace is bought by placating our enemies and abandoning our allies. This may be the most critical election in our nation’s history. Made even more so by those who have been beguiled by Obama’s charismatic presence, into believing that his vision for America really will make their lives better. Those individuals are lost to us. Our only hope is to convince those who are undecided and especially those who feel that their vote doesn’t matter that an absent vote is the same as a vote for Obama. The only way to save our nation is for everyone who is tired of “politics as usual” to understand the disaster that four more years of Obama will bring. Mitt Romney needs your vote. The country needs your vote. Even if the choices aren’t great. Today in stock yards all across the nation, the cattle enjoyed a one day stay of execution. That’s because there was little demand for beef as people crowded into their local Chic Fil A to show their support of Dan Cathy’s First Amendment rights. It was a thirty minute wait for those wonderful waffle fries and peach milkshakes. As my son and I stood in line, I was amazed by what I saw. The line reached around to the back of the building. The drive through line all the way though the parking lot, down the driveway and out to the highway. There were even cops directing the traffic. We had to park a lot away. People even showed up in a church bus. They even came by bus. The mood was neighborly, friendly and festive. What was even more impressive was what I didn’t see. There were no honking horns and hand gestures. No cutting in line. No bored indifferent employees. There were so many “thank you’s” and “pardon me’s” you would’ve thought it was a finishing school exam. Even those who may have disagreed with Dan Cathy’s position showed an enormous amount of class by not showing up to protest. I left with the impression that these people get it. This wasn’t a gay marriage thing, it wasn’t even a Christian thing. It was a Constitutional thing. When the government, be it local, state, or national, tries to silence the opinions of decent, moral, hardworking folks, we just can’t take that lying down. They didn’t during the Boston Tea Party, they didn’t on July 4th, 1776, and we didn’t on Aug 1st 2012.